In this part of the country, we love our trucks. ½ ton pick ups and up. Some use them as a primary vehicle, some for work. Some drive them on weekends. Some drive them day in, day out. In rural Canada, trucks are king. No question. For the most part and to this point, to get the job done, owners traditionally looked to growling V8 monsters (gas or diesel-fuelled), capable of performing just about every task thrown in its 4 x 4 or 4 x 2 path. There was no task too big, no task too small for the venerable workhorse. In Canada, pick up truck sales consistently lead the way for vehicles purchased, month over month. As a matter of fact, the top-selling pick up in this country for 45 years now is the Ford F-150 series, a pick up that comes in about as many variations as Baskin Robbins has flavours. As popular as the F-150 pick up might be, the Ford Motor company has not sat back complacently and watched the orders come in, month in, month out. Well, they have made note of the orders, but a few years back, Ford, like many other manufacturers out there began to realize that the salad days of big honking, fuel guzzling stump-pulling trucks was perhaps nearing an end. People were finally starting to pay attention and made demands on Detroit and Canada’s Big 3 and even popular import manufacturers. Greater fuel efficiency was required. But for trucks, the message was even clearer. Improve the efficiency of the motors to reduce wear and tear on wallets, but don’t even think about sacrificing power and raw, brute strength. Those that work the land or haul loads of lumber and equipment from job site to job site have high, some might argue unrealistic expectations when it comes to their trucks. But now, especially with the high cost of fuel, they want everything they ever had when they turned on their pick up’s engine. And more. Saving money has never been more important – without sacrificing raw power. Now it seems that the engineers at Ford may well have come up with a winning formula with the introduction of the 2011 F-150 with EcoBoost. EcoBoost is a name that Ford has pinned on one or two engines over the past couple of years, especially with the SHO passenger vehicle and the large family-oriented Flex SUV. So what exactly is this EcoBoost they’re almost bragging about? Well succinctly, EcoBoost is a family of turbocharged and direct injected six-cylinder (and four-cylinder) gasoline engines built by the Ford Motor Company. Engines equipped with EcoBoost technology are designed to deliver power and torque consistent with larger displacement, naturally aspirated engines while achieving approximately 20% better fuel efficiency and 15% reduced greenhouse emissions. Imagine that; an eco-oriented pick up! Simply put, relative to the power output and fuel efficiency of hybrid and even diesel technologies, Ford sees EcoBoost as an affordable and versatile alternative and intends on using it extensively in more future vehicle applications – hence the F-150. This truck is a definite game-changer in the world of pick ups. The leopard has managed to change its spots. Really. Under the hood of this venerable pick up is an all new 3.5L V6 with the aforementioned EcoBoost. Will this V6 convince die hard V8 believers? If you look strictly at the numbers, there is little doubt. This engine is a twin-turbo, DOHC – practically unheard of in the truck world. And it runs on regular, readily available unleaded gasoline. Fuel economy is also impressive – 12.9l/100km city and 9.0l/100km highway. Pretty darn respectable for a truck. But what’s next makes it stand out from the pack. This blown V6 motor generates 365hp and 465lb.-ft. torque way down low in the rev range – putting it in the same class as similar trucks with massive V8 engines – but with respectable fuel economy. In fact, fuel consumption even for this twin turbo engine, is reduced by 20 per cent. Even when compared to the F-150 Platinum with a 411hp 6.2L V8, the Ford F-150 V6 with EcoBoost shares a towing capacity at an axle-ripping 11,300lbs and 3,060lbs payload, respectively. That’s right. V8 performance in a V6 package. Some observers have stated for the record that this truck drives more like a turbo-diesel, providing loads of low-end ‘grunt’ with what would appear to be little effort. 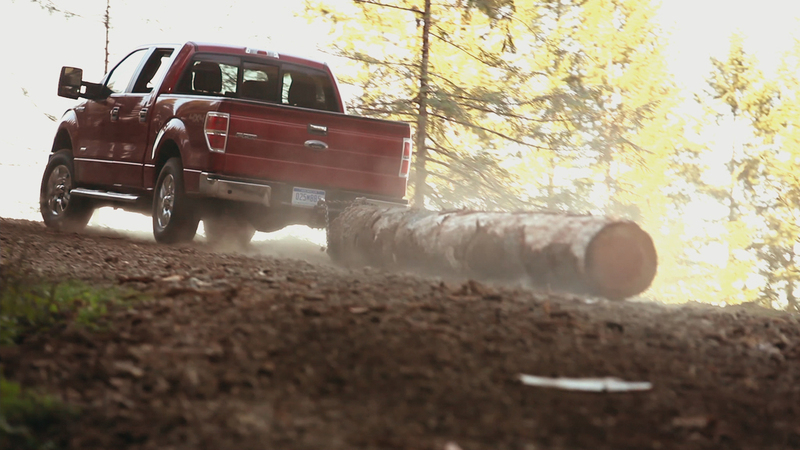 For the first three months of this year, Ford sold 20,000 trucks in Canada. By comparison, Honda, manufacturers of the top selling passenger car in Canada for 13 years running, rang up sales of 12,000 units. It remains to be seen if this new dog can teach some old dogs a trick or two. Ford is expecting big things from this truck. Convincing die-hard ‘big-must-be-better’ customers to consider switching will tell the story. This is a serious contender with a considerable pedigree that cannot nor should not be denied. To appease some skeptics, engineers may have to tweak the exhaust systems, allowing the vehicle to actually ‘sound’ like it’s exerting itself. After all, that’s what everyone is used to. Not this good looking, performance-oriented street or off-road mainstay.